Peter Darjes lived and worked in Uzbekistan for six years. 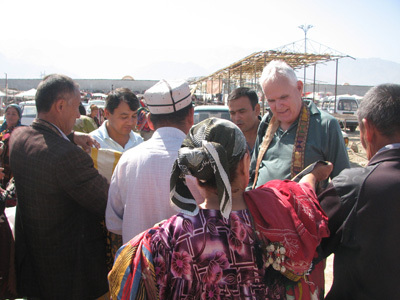 He is exceptionally knowledgeable about Central Asian applied arts. Peter's Uzbek applied art collection is remarkable and in this two-part series he shares his expertise in suzanis. For centuries, Central Asia’s nomadic communities and oasis towns have been home to magnificent works of art. 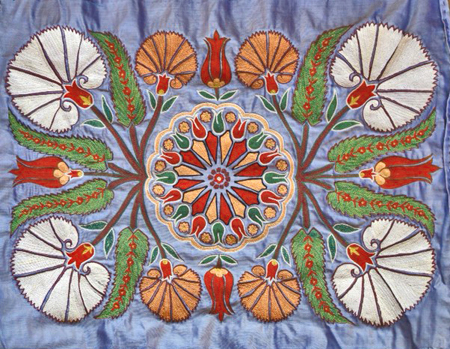 Uzbekistan’s long textile tradition stands out in this regard. Embroidered pieces known as suzanis are particularly popular because of their vibrant colour combinations, enigmatic patterns and intricate embroidery techniques. The designs appear archaic, yet modern, simple and elegant. The significance of suzanis, beyond their decorative value, is still unclear. 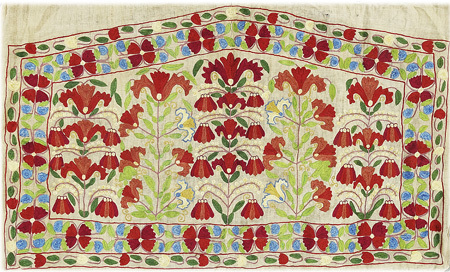 Some have attributed a spiritual meaning, pointing to the protective force of the embroideries. The designs have been linked to Zoroastrianism, sun and totemic cults and also to a cult of nature revival. The name suzani means needlework in Persian. While the Persian word applies to any embroidery, suzani in its western connotation describes silk-embroidered pieces, which, in the traditional homes of Central Asia, were used as wall hangings, bed covers or curtains. From the seventeenth to the nineteenth centuries, suzanis were a prestigious and widespread form of household utensils and decoration. The specific geographical area over which suzanis were spread is concentrated on present-day Uzbekistan, but also covers the regions of Afghanistan, Kyrgyzstan and Tajikistan that border Uzbekistan. The design of suzanis is often believed to be unique to their provenance. Thus, suzanis are referred to as Bukhara, Shakhrisabz, Nurata, or Tashkent style suzanis. Nonetheless, relating the towns to identifying suzanis is prone to error as design features tend to be common to the majority of suzanis, regardless of their provenance. Notable exceptions are the suzanis belonging to the Lakai tribe, as well as Tashkent and Tajik suzanis. The embroidery would be applied to either a cotton or silk foundation consisting of four panels loosely stitched together to enable drawing of a coherent design pattern. Once the design was completed, the foundation would be taken apart and the individual panels assigned to female members of a family, each member expected to embroider one section of the design. Upon completion of the embroidery, the panels would be sewn together. Surprisingly, the division of labour among various women in most cases results in an almost perfect alignment of the individual design sections. By the age of six girls would begin to develop their artistic skills. A suzani would one day become part of a bride’s dowry. The most common technique used in a suzani is chain stitch. The technique enables a series of looped stitches to form a chain-like pattern as well as flowing and curved lines, thus imitating drawings. The motifs dominating the design of suzanis reflect the transition of the society from its previous nomadic base to a settled life in an urban environment. 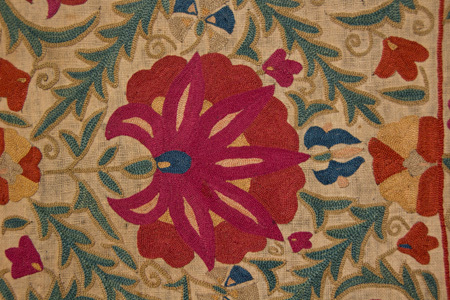 In the second part of this article, Peter will explore suzani designs and regional variations.